Yesterday Apple launched the Apple Card credit card for iPhones in partnership with Goldman Sachs. The card is tied to Apple Pay, a service that lets people load banking information and pay in stores such as Starbucks or use it for online purchases. The Card works globally where Apple Pay is accepted, lets users track spending in the Wallet app, and focuses on transaction privacy. It also includes a cash back program for rewards, including 2 percent cash back on all Apple Pay purchases and 3 percent on Apple Store and services like the App Store. We interviewed a number of finance professionals to find out whether the Apple Card is a good deal for consumers--and got various responses. The bulls note that Apple has a lot more to offer with the Card than just the 2 percent cash back. "What makes the card truly special is how secure it is. Apple won't know what you purchase, where you purchase it, or what you pay for something," notes Camilo Maldonaldo of The Finance Twins. Every payment needs to be authenticated with FaceID or TouchID which means that there is an extra layer of security if someone wants to steal the card. Dave Girouard, the founder and CEO of Upstart, believes the key selling points for the new Apple Card are ease of use, access to past purchases and analytics. "What makes this credit card unique is the direct access of having everything available in one place. There is always an advantage to having easy access to payment on one device. Having the ability to track in real time what you're buying, while having access to the receipts is what makes this card so desirable to consumers," says Girouard. However, not everyone is bullish on the Apple Card. Lou Haverty, the founder of Financial Industry Insider, believes there are many other competitive credit cards that offer higher cash-back rates and no fees. "Citi double-cash is a great example. It offers 2% back on everything," notes Haverty. "I am a bit disappointed that Apple is only offering 3% cash back for Apple purchases. We see a plenty of credit card companies offering 4% on category-specific rewards such as dining," says Mark Huntley, the founder of Credit Knocks. Certain analysts, like Huntley, had expected Apple to go big and offer their customers as much as 5 percent cashback for purchasing Apple products. "3% doesn't seem as big of an incentive considering the cashback competition out there," notes Huntley. In sum, should you get the Apple Card now? Daniel Gillaspia, the founder of the travel rewards blog, UponArriving, nets it out for us: "It's an interesting product with distinguishing features and great for heavy Apple Pay users, but it's not a card I'd be drawn to for unparalleled value." Apple Inc is the market leader in the premium segment of smartphones (iPhone), tablets (iPad), PCs (Mac), TVs (Apple TV) and other services like Apple Music and Apple Pay. Lately, the stock has performed well: it generated a return of 28% in the past year. Yesterday the company presented a new Macbook Air which has a retina display with four times the resolution of its past models at a Brooklyn launch event. The company also announced iPad Pro and Mac Mini updates at the event. Investors are showing interest in the company since consumer sentiment towards Apple products is still very strong. On the other hand, some bearish investors feel that Apple’s market leadership position has reached its peak in various segments (e.g., tablets and smartphones). Last quarter’s revenue rose 17% to $53.3 billion and earnings per share came at $2.34 compared to $1.67 for the same period last year. Fourth-quarter results will be released after market close on November 01, 2018. Analysts expect the company to earn $2.78 per share on revenue of $61.55 billion. The company beat analysts’ estimates in the previous four quarters. 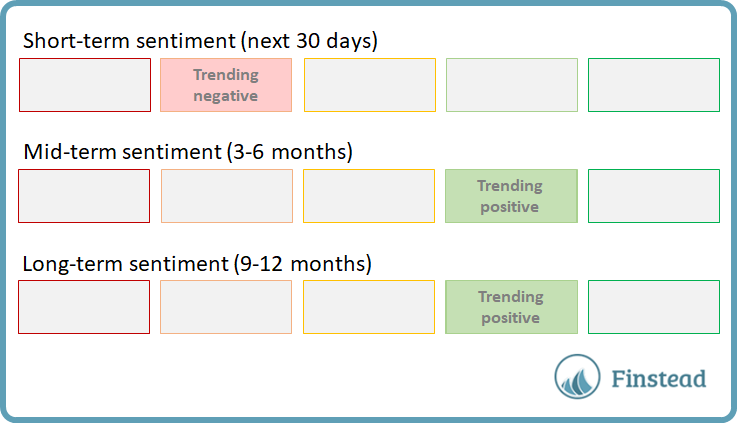 The long-term sentiment (9-12 months) is trending positive. 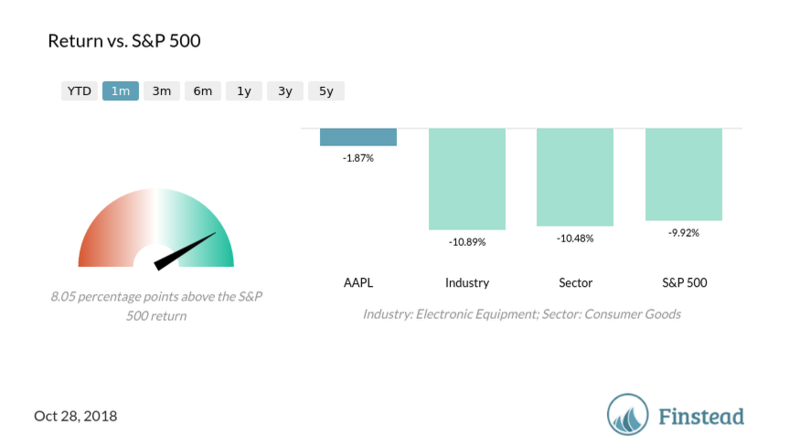 Over the last month, Apple Inc. (AAPL) returned -1.87%. 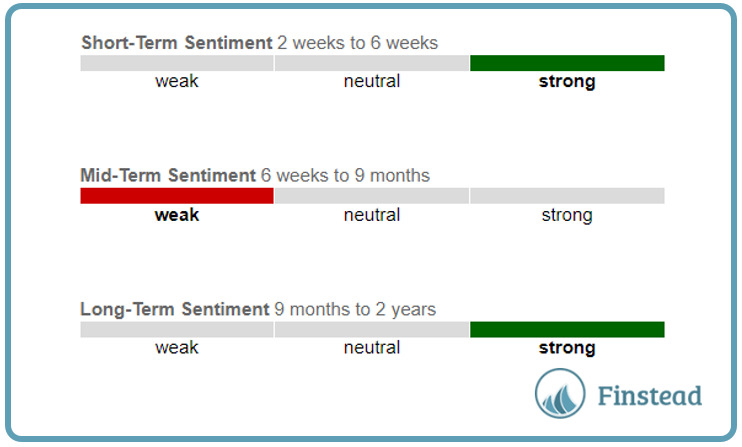 Apple Inc. (AAPL) average analyst price target ($214.44) is -0.86% below its current price ($216.30). For the latest price and information on Apple Inc., please visit Finstead and search for "AAPL price" or "AAPL news". Box continues to ride on increasing adoption of its cloud content management platform by its existing customers as well as new customers. The company is witnessing a solid growth in its paid customer base which is aiding its top-line growth. The company’s efforts toward enriching its cloud management and AI platforms will drive growth in fiscal 2019. Its platform today integrates with some of the biggest enterprise technology providers such as Microsoft, Apple, IBM, Google, and Salesforce. The company enables in-house enterprise developers and independent software developers to create applications with ease. As a result, the company has a strong user base that includes more than 60 million registered users. What worries investors about Box is its profitability. Box has been incurring losses since it went public in 2005; the company had an accumulated a deficit of $1.04 billion. Box’s current focus is on scaling its business through making significant investments in its cloud infrastructure, development, professional services, sales, marketing and so on. The company said that it will continue making such investments and as result does not expect profit in the foreseeable future. 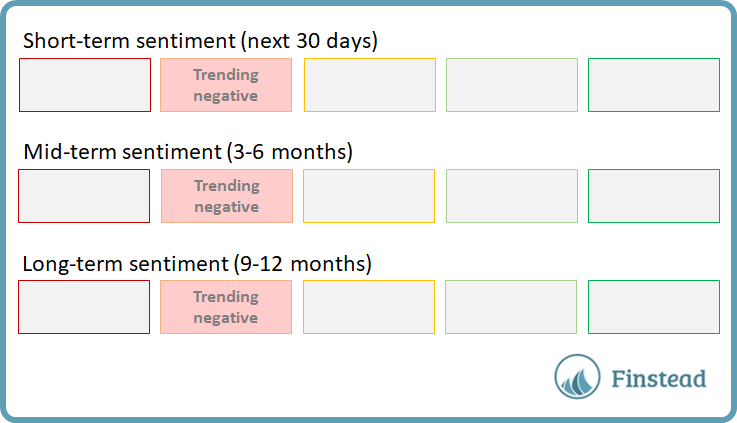 The long-term sentiment (9-12 months) is trending negative. 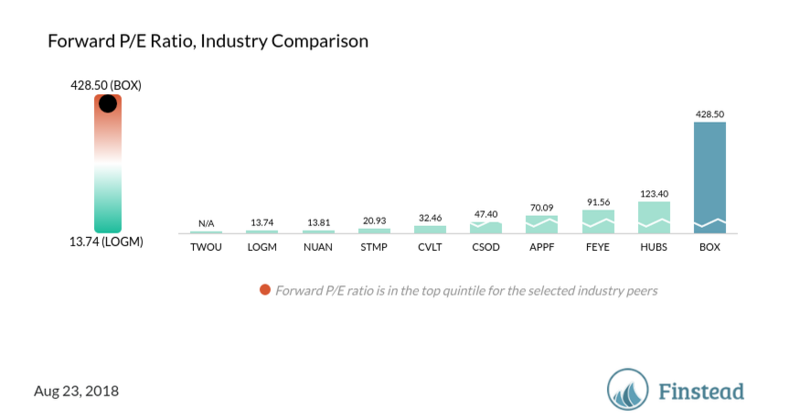 Box, Inc. (BOX) forward P/E ratio is 428.5, and it’s high compared to its industry peers’ P/E ratios. Box, Inc. (BOX) short share of float is 7.7%. The stock is much more frequently shorted than the average industry, sector or S&P 500 stock. Box, Inc. (BOX) average analyst price target ($26.00) is -0.46% below its current price ($26.12). 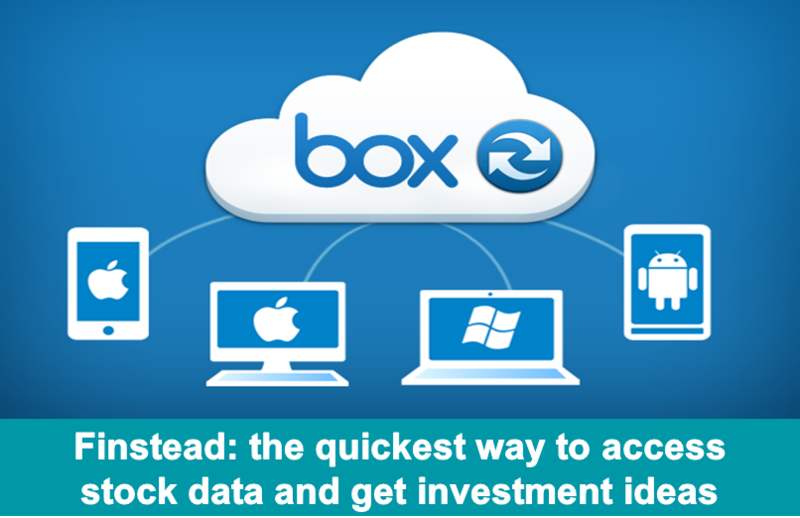 For the latest price and information on Box, Inc., please visit Finstead and search for "BOX price" or "BOX news". Fitbit, Inc. (FIT) is expected to report earnings on August 1 after market close. The report will be for the fiscal quarter ending June 2018. Shares are trading at 6.00, down -0.33%. 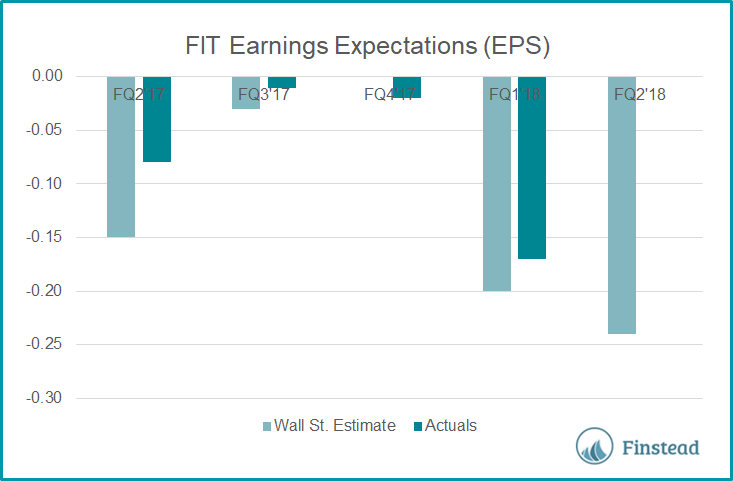 What are FIT earnings expectations? What news should investors be paying attention to? Fitbit investors have seen a plenty of stock volatility in the recent months. The shares have soared and dropped frequently, as different ideas about the future of the company are presented. Fitbit was the first company to offer a wearable fitness tracker that appealed to a broad market. The Fitbit Versa smartwatch is the product investors think will turn the company around. The product retails for $200 and includes a plenty of useful features: workout tracking, heart rate, female health, sleep tracking, limited apps, and notifications. It also boasts a long battery lifetime: 4 days. Fitbit (NYSE:FIT) wearables and Apple (NASDAQ:AAPL) watches could be soon hit with the latest round of U.S. tariffs on $200B of Chinese goods. These products fall under the subheading of data transmission machines in U.S. tariff codes and appear to be included in the list of President Trump’s most recent tariff proposal. Beat analyst EPS estimates by 3 cents ($-.17 actuals vs. $-.20 forecast) in FQ1’18. For FQ2’18, EPS is expected to decline by 200% year-over-year to $-.24, while revenue is expected to decline 19% year-over-year to $286 million. 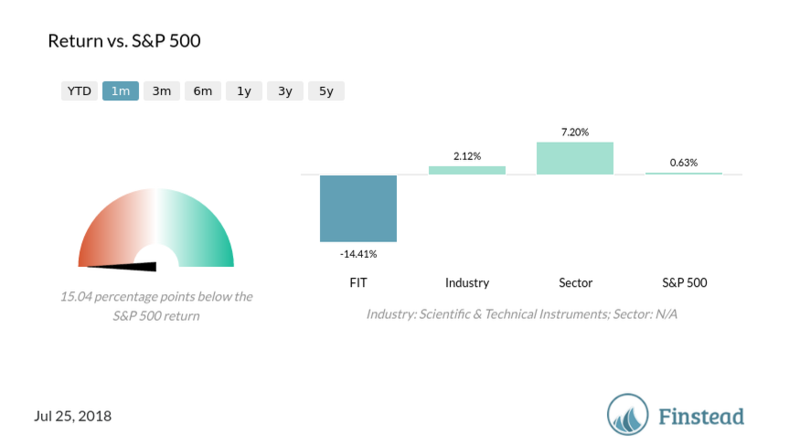 Over the last month, Fitbit, Inc. (FIT) returned -14.41%. Fitbit, Inc. (FIT) short share of float is 13.4%. The stock is much more frequently shorted than the average industry, sector or S&P 500 stock. Fitbit, Inc. (FIT) average analyst price target ($6.06) is 1% above its current price ($6.00). 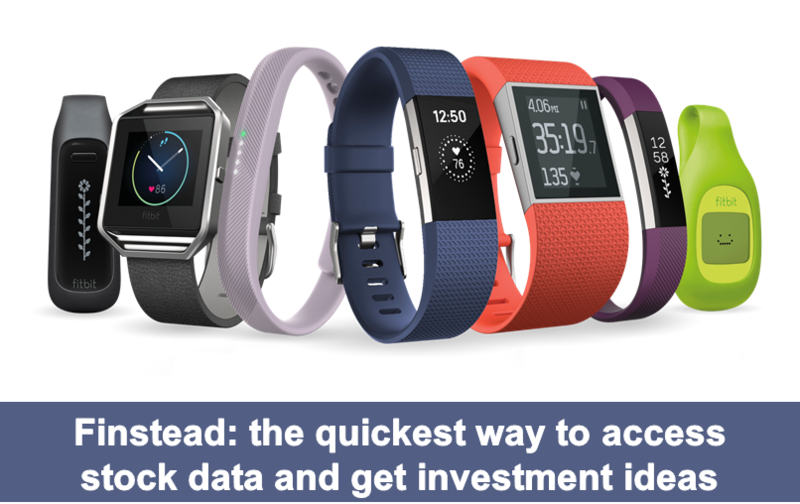 For the latest price and information on Fitbit, Inc., please visit Finstead and search for "FIT price" or "FIT news". Pandora Media, Inc. (P) is expected to report earnings on July 31 after market close. The report will be for the fiscal quarter ending June 2018. Shares are trading at 8.19, down -0.12%. 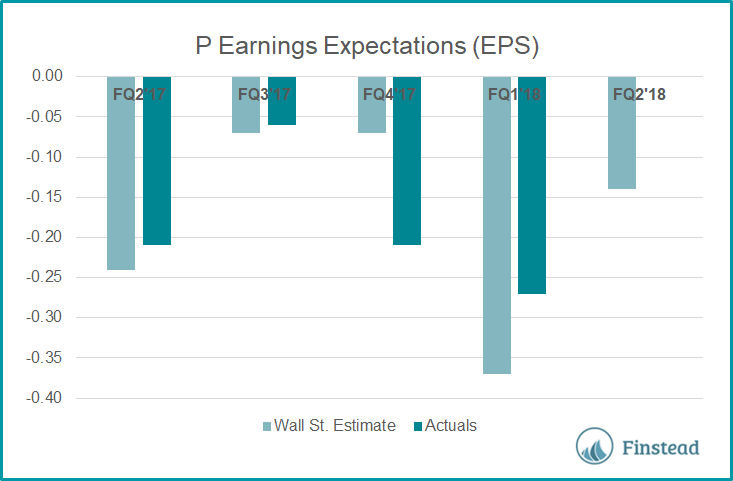 What are P earnings expectations? What should investors know about Pandora? 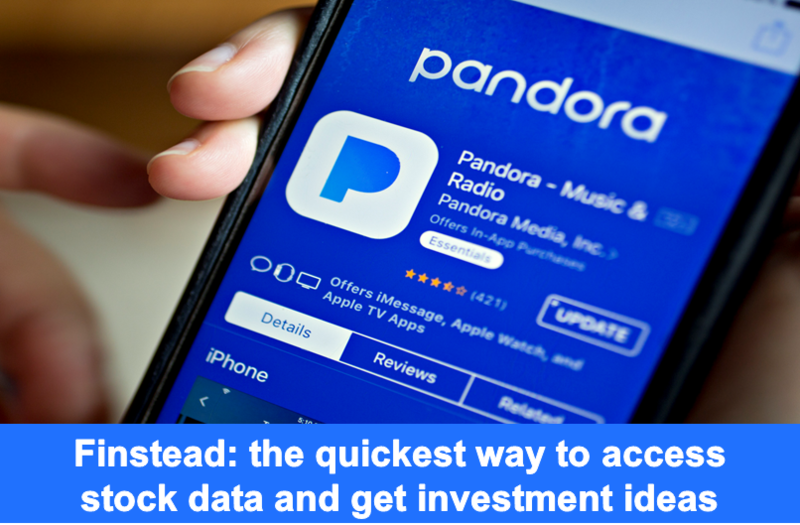 The Pandora stock has been worn down by years of competition with Spotify (NYSE:SPOT) and Apple (NASDAQ:AAPL), but in the past 3 months, it finally showed signs of life. The 50% surge in the last 3 months brought the stock price back up to the levels from over a year ago. The bulls are stoked about Pandora’s subscription services and also the AdsWizz acquisition, which powered the stock’s recent comeback. AdsWizz is an ad-tech platform that serves as a marketplace for programmatic audio ads. AdsWizz has many customers. The bulls claim that the ad platform will help Pandora benefit from secular growth in audio and voice, and AdsWizz success on a quarterly basis won't be completely correlated with listening trends at Pandora. So the company’s future will be a bit less tied to actual Pandora listening. Beat analyst EPS estimates by 10 cents ($-.27 actuals vs. $-.37 forecast) in FQ1’18. For FQ2’18, EPS is expected to grow by 33% year-over-year to $-.14, while revenue is expected to decline 1% year-over-year to $374 million. 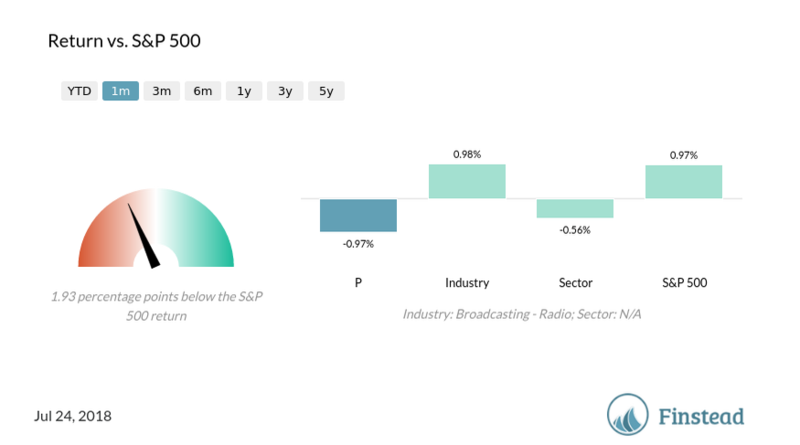 Over the last month, Pandora Media, Inc. (P) returned -0.97%. Pandora Media, Inc. (P) average analyst price target ($7.40) is -9.65% below its current price ($8.19). For the latest price and information on Pandora Media, Inc., please visit Finstead and search for "P price" or "P news". Pandora allows users to listen to music selections based on the user's artist or genre preference and then provide positive or negative feedback, which is utilized by the program to choose subsequent musical selections. Pandora can be accessed through a web browser or the company's application that can be downloaded to a personal computer or mobile phone. The service is available in the United States, Australia, and New Zealand. Pandora derives the majority of its revenue in the United States. Apple Inc. (AAPL) is expected to report earnings on July 30 before market open. The report will be for the fiscal quarter ending June 2018. Shares are trading at 193.24, up 1.63%. 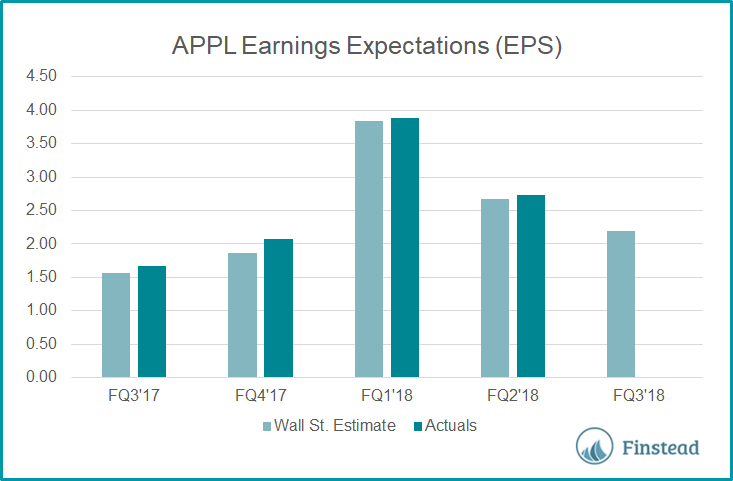 What are APPL earnings expectations? 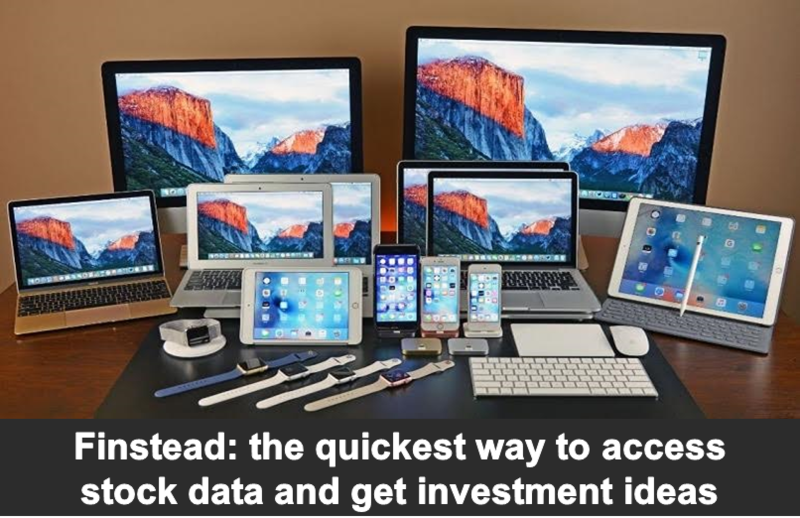 What should investors know about Apple prior to the earnings? Apple’s competitive advantage stems from its ability to package hardware, software, services, and third-party applications into sleek, intuitive, and appealing devices. This expertise enables the firm to capture a premium on its hardware, unlike most of its peers. Despite its admirable reputation, loyal customer base, and a myriad of unique products, the consumer hardware space can be unforgiving to firms unable to consistently satiate the customer’s appetite for more features. Following a solid rebound in fiscal 2017 where Apple enjoyed healthy sales of iPhones, Macs, Services, and Other Products, the firm is poised for stellar revenue growth of 13% in fiscal 2018 thanks to the iPhone X and iPhone 8 launches at higher average selling prices than prior iPhones. Meanwhile, both Services and Other Products, including AirPods and Apple Watch, will grow 21% and 31%, respectively. While analysts foresee a slowdown in iPhone spending in fiscal 2019 and fiscal 2020, the smartphone titan will generate midcycle revenue growth in the mid-single digits. The firm enjoys stellar returns on its devices by offering a unique user experience with its iOS ecosystem. Contrary to its peers in PCs and smartphones that rely on relatively open operating systems, Windows and Android, respectively, Apple’s walled garden approach for its popular iOS allows it to charge a premium for relatively commoditized hardware not too different from that sold by Samsung, Dell, and others. Customer switching costs are elevated for Apple users as a non-Apple iOS experience does not exist, unlike computing platforms for the Windows or Android ecosystems that boast PCs and smartphones from many firms. Beat analyst EPS estimates by 6 cents ($2.73 actuals vs. $2.67 forecast) in FQ2’18. For FQ3’18, EPS is expected to grow by 31% year-over-year to $2.19, while revenue is expected to grow 15% year-over-year to $52.37 billion. 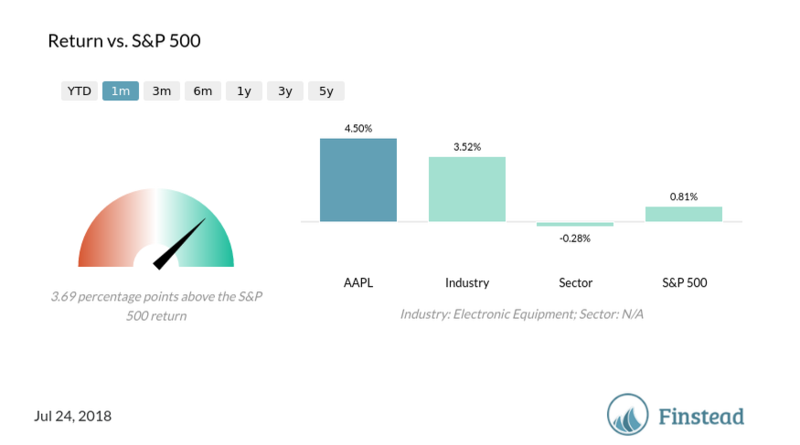 Apple Inc. (AAPL) average analyst price target ($197.76) is 2.34% above its current price ($193.24). QUALCOMM (QCOM) is expected to report earnings on July 25 after market close. The report will be for the fiscal quarter ending June 2018. Shares are trading at 58.35, down -0.07%. 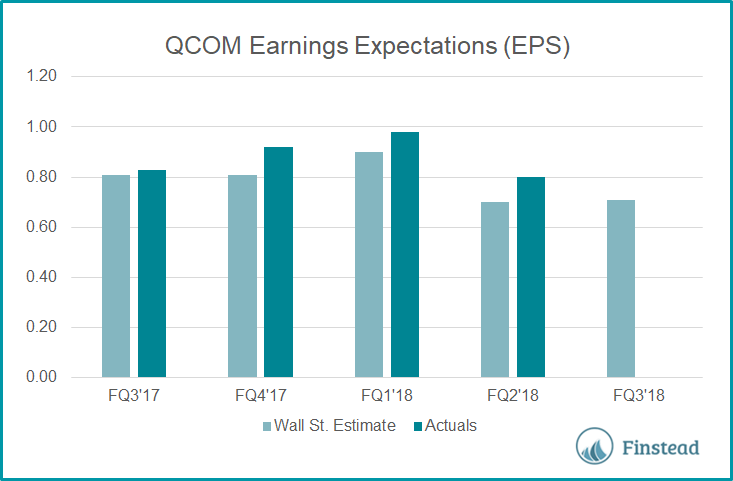 What are QCOM earnings expectations? What news will the market be watching out for? Analysts expect Qualcomm’s licensing business to show a solid growth, because of increased 3G and 4G device adoption. However, recent government investigations into the business model and the Apple lawsuit against Qualcomm’s business practices have increased the possibility of negative effects on royalty revenue. Qualcomm may be able to withstand these inquiries and maintain adequate royalty rates. Qualcomm is a steward of the digital communication technology known as CDMA, which is commonly referred to as a third-generation, or 3G, wireless communications standard. 3G allows devices to send/receive voice signals and wireless data, and has played a major role in the proliferation of mobile devices. Qualcomm’s treasure trove of patents (with a monopoly in 3G and a significant portion of 4G) allows the firm to charge device-makers a royalty fee as a percentage of the price of each 3G and 4G device sold (as most 4G phones are backward-compatible with 3G). The firm also designs chips used in smartphones. This part of the business does not have nearly as strong of a competitive advantage as licensing, nor is it as profitable. Qualcomm’s high-end Snapdragon application processors were once commonplace in high-end smartphones, but the shift toward in-house chips has threatened Qualcomm’s position. The major blow occurred when Samsung utilized internally developed chips in its Galaxy S6 device. While Qualcomm has reclaimed some business back at Samsung, there will be fewer lucrative opportunities going forward, owing to competition and OEMs that build their own chips. The firm historically also had a competitive edge in baseband chips, which are critical to devices’ inherent ubiquitous connectivity. Qualcomm had been the sole baseband supplier at Apple for multiple iterations of the iPhone, but Intel has since won a portion of this business. Beat analyst EPS estimates by 10 cents ($.80 actuals vs. $.70 forecast) in FQ2’18. For FQ3’18, EPS is expected to decline by 14% year-over-year to $.71, while revenue is expected to decline 2% year-over-year to $5.2 billion. 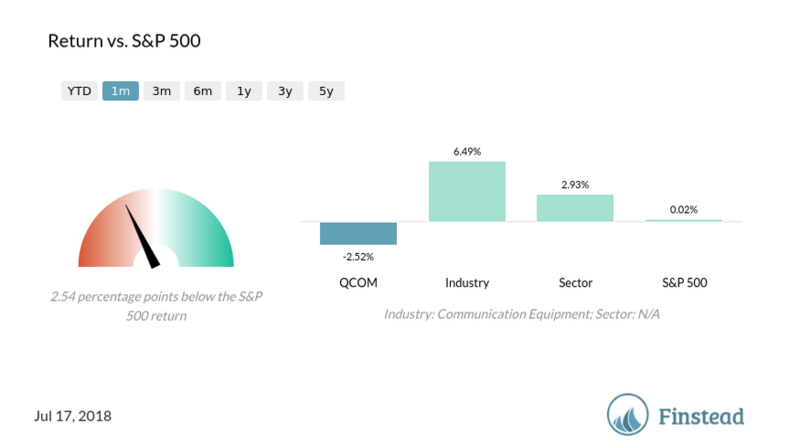 Over the last month, QUALCOMM (QCOM) returned -2.52%. QUALCOMM (QCOM) average analyst price target ($63.41) is 8.67% above its current price ($58.35). 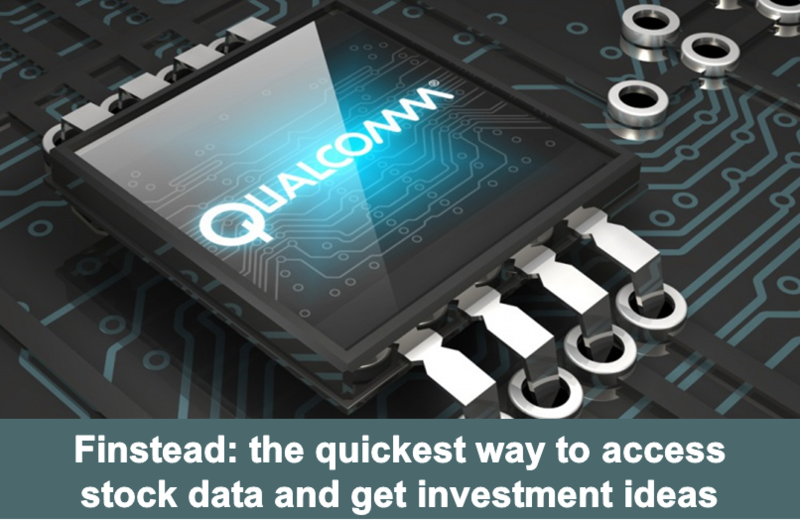 For the latest price and information on QUALCOMM, please visit Finstead and search for "QCOM price" or "QCOM news". Just as ValuEngine downgraded Energous (WATT), investors reacted violently and bought shares of this company. The stock price is up 6% in mid-day trading today. What is driving this? What is WATT stock price forecast? Energous Corporation develops a wire-free charging system. Its key product WattUp consists of semiconductor chipsets, software, hardware designs, and antennas that enables radio frequency based wire-free charging for electronic devices, providing power at a distance and enables charging with mobility under software control. As a pioneer in wireless charging, Energous has a significant long-term potential. Our technical analysis confirms this--and also highlights a strong positive short-term sentiment. The mid-term potential looks a little less promising. Short-sellers doubt that Apple will ever use Energous' wireless charging technology. However, VentureBeat reported that Energous and Apple have been working together since 2014. S&P Capital IQ analysis shows strong growth prospects for the stock. However, the analysis also highlights high stock valuation and relatively poor financial health. See details below. 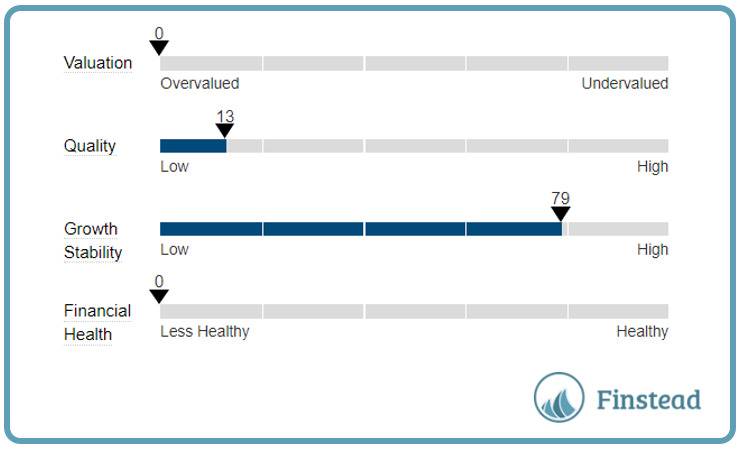 Equity analysts are positive above Energous stock price prospects. 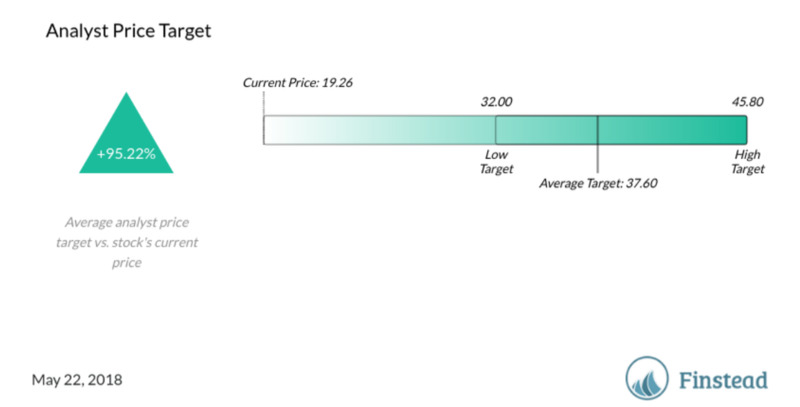 Based on Finstead research, WATT average analyst price target is $37.60 (visit Finstead and type "WATT price target" or "WATT upside" to get the latest scoop on equity analysts' position). 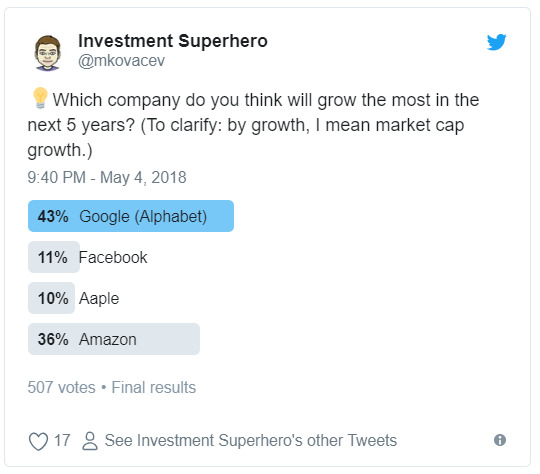 This past weekend we asked stock investors on Twitter: which company among the tech giants (Google / Alphabet, Apple, Amazon or Facebook) will outgrowth the competition? We got some pretty insightful responses from our Twitter audience and are sharing with you their growth predictions in this Finstead Bites post. Our Twitter poll shows, investors feel more optimistic about Alphabet (Google) and Amazon, and less optimistic about Facebook and Apple when it comes to those companies' growth prospects. Buy-side stock analysts, on the other hand, do not see as much stock price upside for Amazon and envision a greater upside for Facebook. This is somewhat understandable, given Facebook's recent snafu caused by user data leak. GOOGL price target upside is 21.09%. FB price target upside is 25.68%. AAPL price target upside is 3.73%. AMZN price target upside is 3.96%. Alphabet's history of execution is unparalleled... it has made significant investments to diversify its revenues, and the effort is paying off. Online and mobile video consumption is going through the roof and Alphabet remains strongly positioned here with YouTube. In its race to target TV ad dollars, Alphabet allowed Nielsen and comScore tagging of YouTube videos to determine the effectiveness of YouTube vs (compared to TV ads)--and YouTube is winning thus far. Android’s dominant global market share of smartphones leaves Google well positioned to continue generating top-line growth as search traffic shifts from desktop to mobile. Comparing Alphabet and Amazon, it's important to note that those two are still fundamentally different businesses. While they compete in many areas, they focus on different things. The two companies are in the same range based on the market capitalization. However, Amazon employs a lot more people (over 340,000) than Alphabet (78,000+). Amazon generates more revenue than Alphabet ($178B vs. $111B), is growing significantly faster (38% vs. 24%), but is also less profitable (1.7% vs. 11.42%). 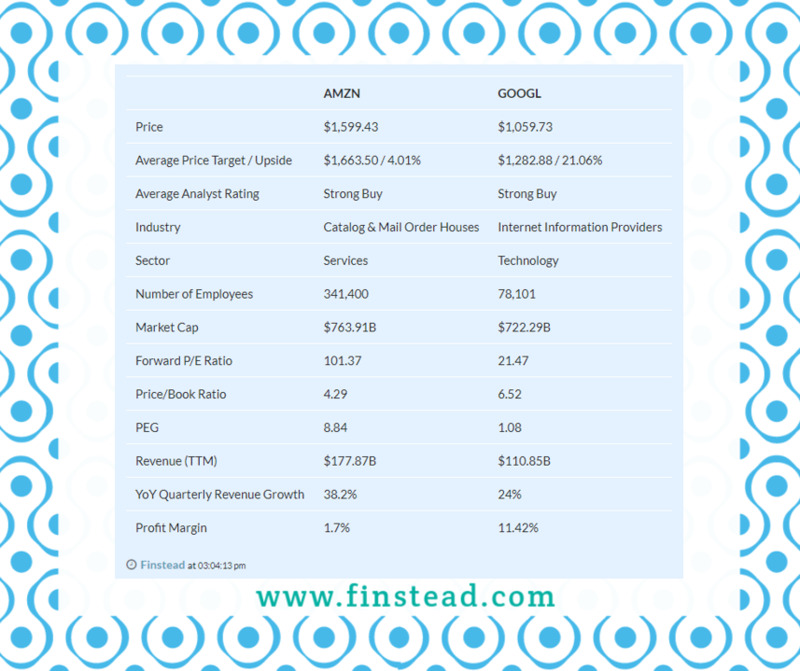 For a detailed comparison of the two companies, please visit Finstead and type AMZN vs. GOOGL.